During the group phase of the 2014 World Cup, 122 goals were scored (excluding penalties and own goals) in 48 matches, a scoring rate of 2.54 goals per match. The 16 matches played in the second round produced just nine goals in normal time after excluding Huntelaar’s penalty and Yobo’s own goal, a rate of 1.13 goals per match. This is an enormous drop from the group stage so what is going on? The shot conversion rate from non-penalty shots (to make comparison fair) in the group phase was 10.2% with the Dutch the best at 26%, netting 10 goals from just 39 shots. Against Mexico, the Dutch scored just one non penalty goal from 12 shots, a conversion rate of just over 8% which is quite a drop. That conversion rate is actually the key to the decline in goals across the board. 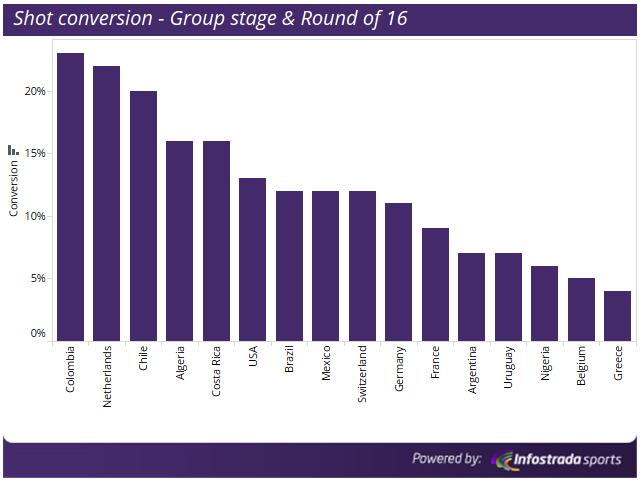 In fact, the Dutch conversion rate in their second match was relatively good in comparison to other teams. This entry was posted in Uncategorized and tagged Algeria, Argentina, Belgium, Brazil, Chile, Colombia, Costa Rica, France, Germany, Greece, Mexico, Netherlands, Nigeria, Switzerland, United States, Uruguay, USA. Bookmark the permalink.